The Yacht & Brokerage Show in Miami Beach is attracting more new boats this year — just one of the factors making it the biggest in its 25-year history. That’s according to Efrem “Skip” Zimbalist III, chairman and CEO of Active Interest Media and its Show Management affiliate, which produces and manages the Feb. 14-18 event. “We’ll have more boats than ever before, which is great news,” Zimbalist said in mid-January. Several OEMs are exhibiting for the first time, others are expanding their displays and some who had put the show on hold during tough times are coming back. 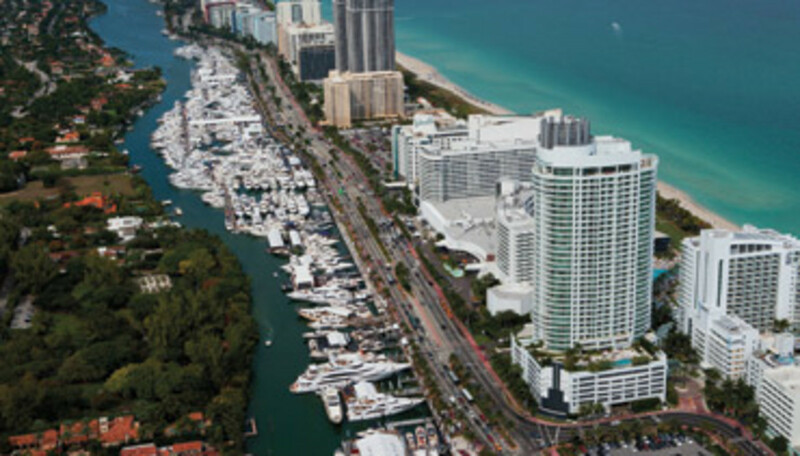 The show, which is owned by the Florida Yacht Brokers Association and runs concurrently with the Miami International Boat Show, is nestled on a mile-long stretch of Collins Avenue between 41st and 51st streets in Miami Beach. 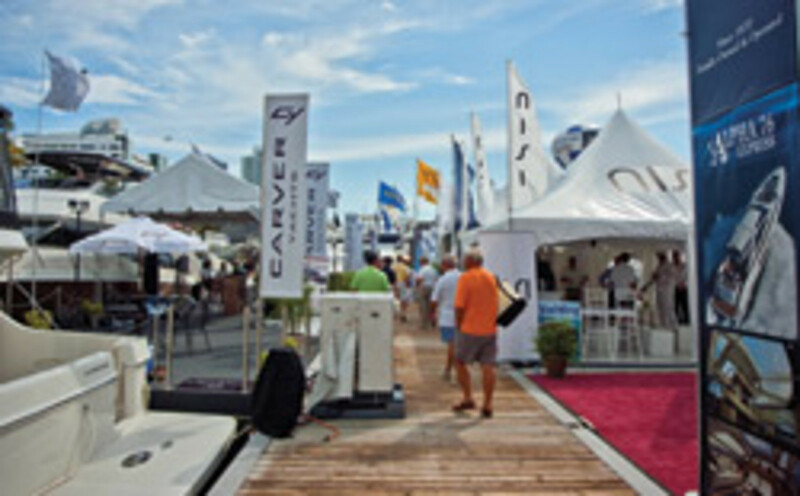 Although it is separately owned and operated from its National Marine Manufacturers Association counterpart, consumers have come to see the two shows as one huge venue. Cautiously measured optimism has preceded many of the recent boat shows, but the energy surrounding the Miami shows goes beyond cautious. Fabre says the voyage of the Swift Trawler 34 on the Great Loop generated a lot of attention for the brand. “We got so much press that everywhere we go, we have people who come to see the 34 that did that Great Loop,” Fabre says. “That’s really good. Now nobody is questioning that we are making powerboats, if a single-engine can do the Great Loop in four months. Sealine is another company that plans to capitalize on its recently established brand status at the Yacht & Brokerage Show, says general manager Tom Riemann. The British builder reintroduced the brand to the American market at the Fort Lauderdale International Boat Show in October, and Riemann says he’s looking forward to using product feedback from that show to unveil tweaked and new products in Miami Beach. The Collins Avenue location is unique from other shows for a few reasons, Graziano says. First, it offers free admission. The tone is also unique because several of the barge displays built for specific OEMs do not have a path to or from other exhibits, so customers come in and out of their own private barges, Graziano says. Fabre appreciates the European flavor of the Yacht & Brokerage Show. “The convention center is very organized, so when you want to have your image come across in a specific way, Collins is offering a bit more freedom,” he says. Exhibitors also are allowed to entertain after the 7 p.m. show close, which makes for a uniquely festive atmosphere, Graziano says. “There are various parties going on after show hours in the evenings,” he points out. Boats in the Yacht & Brokerage Show range from 40 to 200 feet, with a total worth of about $1 billion, Graziano says. The two largest yachts will be Lady Linda, a 187-foot Trinity, and Diamonds Are Forever, a 200-foot Benetti, Zimbalist says. There also will be two floating cocktail barges, according to Graziano. 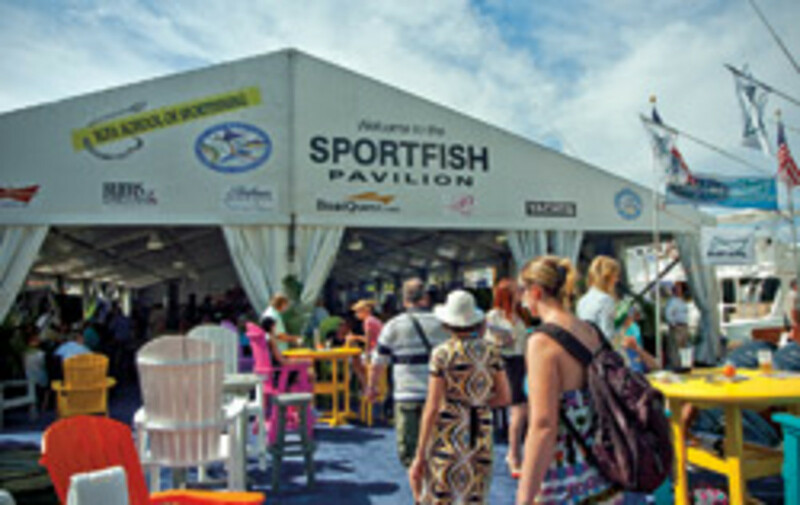 A 16,000-square-foot floating Sportfish Pavilion will feature fishing products, and it connects the sportfishing OEM displays, Graziano says. The front features a cocktail barge, and the back has ongoing seminars sponsored by the International Game Fish Association. There’s also a 25,000-square-foot covered tent that makes up the marine equipment pavilion, which features products such as stabilizers, electronics and other yacht accessories, Graziano says. TrawlerPort, sponsored by Soundings Trade Only sister publication PassageMaker magazine, will be at the north end of the show and will feature not only the long-range cruisers, but also continuous seminars, Graziano says. The show covers 1.2 million square feet; the marina that Show Management builds is 1,841,000 square feet and it accommodates about 450 of the 500 yachts in the show.